Taxonomies are often thought to play a niche role within content-oriented knowledge management projects. They are thought to be ‘nice to have’ but not essential. In this ground-breaking book, Patrick Lambe shows how they play an integral role in helping organizations coordinate and communicate effectively. Through a series of case studies, he demonstrates the range of ways in which taxonomies can help organizations to leverage and articulate their knowledge. A step-by-step guide in the book to running a taxonomy project is full of practical advice for knowledge managers and business owners alike. Patrick Lambe is a widely respected knowledge management consultant based in Singapore. His Master’s degree from University College London is in Information Studies and Librarianship, and he has worked as a professional librarian, as a trainer and instructional designer, and as a business manager in operational and strategic roles. He has been active in the field of knowledge management and e-learning since 1998, and in 2002 founded his own consulting and research firm, Straits Knowledge, with a partner. He is former President of the Information and Knowledge Society, and is Adjunct Professor at Hong Kong Polytechnic University. 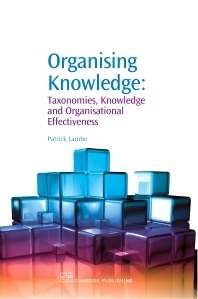 Patrick speaks and writes internationally on knowledge management, and has conducted a number of taxonomy projects, usually as an integral part of larger knowledge management initiatives. He is the author of The Blind Tour Guide: Surviving and Prospering in the New Economy (Times, 2002). His knowledge management writings are posted at www.greenchameleon.com.